Berlin-based EANTC is joining the roster of independent test labs that will play a vital role in the Broadband Forum's CloudCO (Cloud Central Office) initiative. As part of such efforts, the Forum has been teaming up with independent test labs that can run interoperability and verification programs for vendors seeking assurance that their products are meeting the required specifications for CloudCO projects such as OB-BAA. The Forum had already selected CAICT (China Academy of Information and Communications Technology) (already up and running with CloudCO use cases) and the University of New Hampshire InterOperability Laboratory (IOL) (ready to begin testing soon) as test partners and now the European Advanced Networking Test Center AG (EANTC) , well known for its telco technology test programs during the past couple for decades, has been selected as the European facility. The EANTC team is currently building its core telco virtualization platform, with VMware Inc. (NYSE: VMW) as the initial provider of the underlying infrastructure, with a view to starting CloudCO tests in early 2019. Ultimately, other cloud infrastructure suppliers could get involved as the test programs develop and operators request specific multi-vendor scenarios. The aim of the test facility is to enable vendors to develop CloudCO-ready applications, not to run pass-or-fail programs. EANTC founder and managing director Carsten Rossenhövel says there will be "no finger-pointing about outcomes… the vendors that stand out will be the ones that aren't participating in the test programs," he notes (with a glint in his eye). 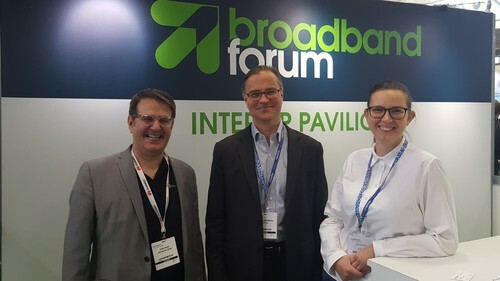 Broadband Forum CEO Robin Mersh, EANTC founder and managing director Carsten Rossenhövel and EANTC head of marketing Kathrin Henze at the recent Broadband World Forum in Berlin. Broadband Forum CEO Robin Mersh says network operators could undertake to do the testing themselves, but it is "a huge challenge" -- all parties agree that having a few trusted "neutral environment" test partners is more efficient than multiple, individual tests. In addition, no vendor wants to fail a test in an operator lab: Failing a test and then being able to fix and re-test in an independent lab is a much easier proposition for a vendor to take on board. What's important ultimately, is that operators can trust the lab test outcomes and move ahead more quickly with their next generation access architectures. However, it's unlikely at this point, notes Mersh, that the results of the tests programs will be published, though down the line there could be a move to introduce certification. It seems, then, that 2019 should be an active year for vendors proving their technology developments against the Forum's test cases and attracting the attention of the operators moving planning more open, virtualized access network environments. And given that Huawei Technologies Co. Ltd and Nokia Corp. (NYSE: NOK) were demonstrating at the Broadband World Forum how their respective OB-BAA code can coexist in the same deployment, it's reasonable to expect that those companies would be near the front of the queue to prove themselves in the neutral labs.